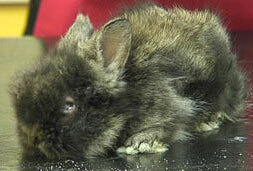 Conjunctivitis is a common eye disease in rabbits. While at the best of times it is a concerning disease, this article shows that in young individuals it can quickly become a dreadful condition if left untreated. The patient is 5 weeks old and has been suffering with conjunctivitis for as long as the owner can remember. The left eye is a good example of the typical presentation for conjunctivitis: the conjunctival membranes around the eye are red and swollen. There is also a thick purulent discharge. The right eye is closed and the owner mentioned that he never saw it open but did not pay much notice to this. The opening of the eyelids by the vet allows the expulsion of a profuse purulent discharge. As a result of the conjunctivitis, the purulent discharge crusted and sealed the eyelid. The pus accumulated behind the eyelids. Following gentle cleaning of the discharge, we can now take a look at the eye. 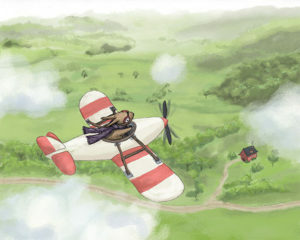 Like the left one, it is affected with severe conjunctivitis. Because the baby rabbit was off his food and quite lethargic, it proved necessary to force feed him with a syringe. The preparation is a professional complete preparation designed for that use only. Following administration of all the medication, the rabbit already seems to feel much better and explores his new environment. Finally it is important to note that the treatment will work well if the conjunctivitis is caused by an infection. 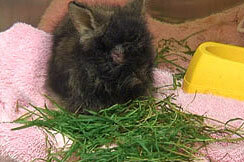 However it is common for conjunctivitis in rabbits to be secondary to other illnesses such as dental disease. Should the condition not improve quickly, further investigation will be necessary to find out what the underlying cause of the problem is. In conclusion, I would like to stress that most cases of conjunctivitis, and in fact most cases where an eye appears red, require prompt medical attention. Always consult your vet sooner rather than later especially in young animals, and don’t wait to see if the problem will self resolve.